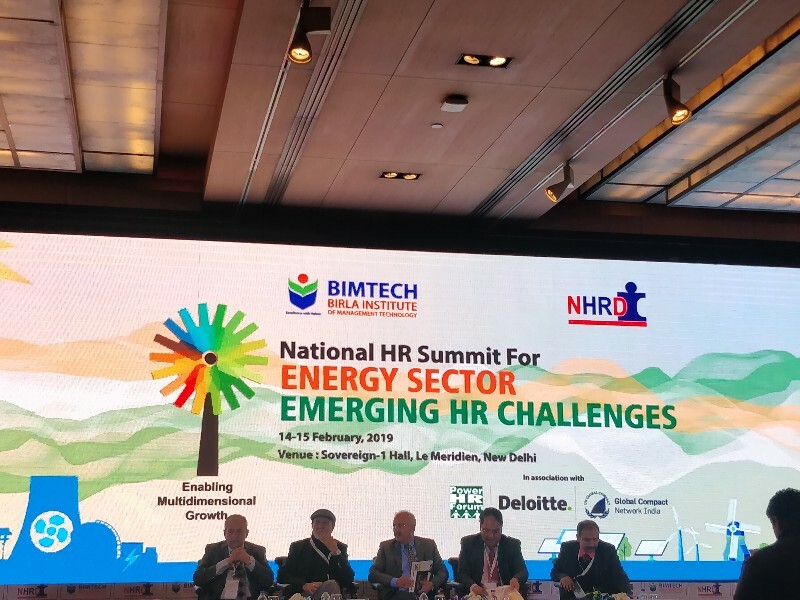 New Delhi: BIMTECH and NHRDN organized a "National HR Summit for Energy Sector Emerging HR Challenges" in New Delhi. The Two-day Summit will be taking Place at Hotel Le Meridien from 14-15 February in National Capital. The Summit witnessed the presence of who’s who of Energy sector and HR leaders. Dr. H Chaturvedi, Director, BIMTECH, Padma Shri Dr. Pritam Singh, Chairman, LEAD Centre, Former Director, IIM (L), MDI, Gurgaon and Former Director General of MI, New Delhi. R V Shahi, Chairman, Energy Infratech Private Ltd. and Former Secretary, Ministry of Power, Govt. of India, Ajay Kumar Bhalla, Secretary, Ministry of Power, Govt. of India, Dhananjay Singh, Director General, NHRDN were the dignitaries who benefitted the summit delegates with their insightful addresses. "The energy sector is going through a great transformation. The energy sector should be cope up with good infrastructure. Along with this there is need to focus on HR department to take care of skill development. HR Challenges are shortage of staff and talent. HR plays a very big role in the Growth of a company specially in Energy Sector." " The last few years of Indian Energy sector have undoubtedly, witnessed a tremendous growth. However with the disruptive technology occurring globally, the challenges in the segment are huge." "The HR are the best assets for any organization! It is therefore, essential that we provide a cogenial environment, a friendly workplace Oppurtunties for growth and advancement." "India has started the procedure to quickly grow energy instruction in the nation, to empower the current HR personnel to learn courses related to energy limit expansion, generation, operations and support, in their educational programs."